Hi everyone. 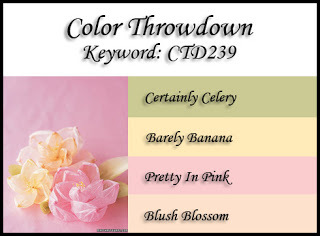 Today I have made a card for the color challenge at Color Throwdown (CTD239 - certainly celery, barely banana, pretty in pink, blush blossom). I die-cut the cones from Crumb Cake cardstock, and ran my blender pen (and a little Soft Suede ink) along the embossed "waffle" design. Then I sponged more Soft Suede ink along all the edges and shaped the cones with my mat and stylus. 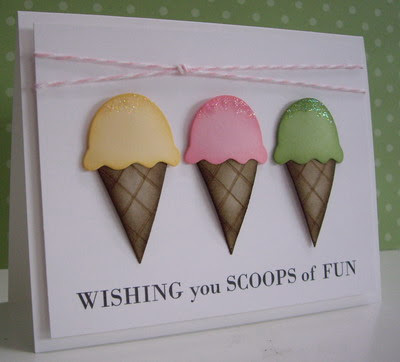 I die-cut the ice cream scoops in the three colors of cardstock and then sponged around the edges with the matching colored inks. I added some bling on top of the scoops. I printed off the sentiment onto my card front, adhered the cones and scoops using dimensionals and added a knot of twine to finish things off. Fun and easy card! Welcome to our newest member, Deepti!! So glad to have you with us!! Yummy! This makes me want an ice cream cone! Very cute , looks good enough to eat! Really fun and delicious card! 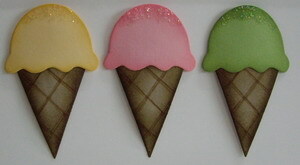 FABULOUS........Loll, these look good enough to eat! Simply delicious fun with sprinkles on top! They are definitely ice cream flavours! Great sentiment too! Loll, you gave me some much needed laughter today! From a vase to ice cream (ice cream being my prferenance!) just made me laugh out loud. I needed some laughter and I love the card! Too darn cute. I totally agree with seeing ice cream flavors, and now I see ice cream cones and I'm trying not to lick my monitor. Absolutely the cutest cones EVER! Well done, Lolly! !